Despite the new characters to ogle at, the real guts to this trailer is information regarding the Atelier Tent. Synthesis is, as always, an integral part to this Atelier game. Firis’ Atelier takes the form of a portable tent, allowing her to synthesize wherever her heart desires. The Tent can also be personalised to display keepsakes from her adventures. Now that synthesis is on the move, there are changes to the system as a whole. For example, Mass Synthesis lets Firis create items as large as a bridge or a boat. Atelier Firis: The Alchemist and the Mysterious Journey launches March 7 for PlayStation 4, PlayStation Vita, and PC via Steam. Preorders via Amazon, Best Buy, EB Games, or GameStop will unlock two useful costumes, Resort Vacation (increased odds of finding high-quality materials) and Wonderland (decreased time for synthesis and fast traveling). It's always nice when predictions come true: in our Catch-up coffee of January 26 we opined: ".. we anticipate that this crossover may be considered for a Western localisation." 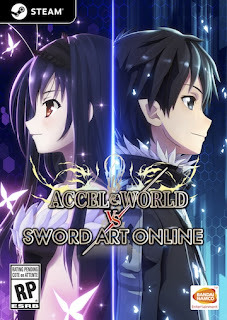 Bandai Namco announced that Accel World vs. Sword Art Online is coming to PlayStation 4 and PlayStation Vita in North America and Europe this (northern) summer. For North America, release will be digital-only on both systems, whereas for Europe the PS4 version will also see a physical release. The various box art for the versions also shows a Steam edition (see above); however, no PC version has been mentioned so far. Developer Keen Games and publisher 505 Games announced that Portal Knights, the sandbox crafting RPG adventure, is coming to PlayStation 4 and Xbox One in Europe on April 28 and in North America on May 2. Portal Knights has been in Early Access for PC on Steam since February 2016 and has overall “very positive” user reviews. The game will launch fully on PC on April 28. The description for the game states: "No one can remember how long it’s been since the peaceful world was torn apart by The Fracture, plummeting it into darkness. Is there any soul brave enough to reunite the shattered realm?” The player can travel between randomly generated 3D sandbox worlds where they mine and gather resources to craft your arsenal and supplies, as well as build a home and start a farm to grow crops in real-time. There are three RPG character classes to choose from — Warrior, Mage, or Ranger — and the ability to customise your appearance, skills, and gear. Portal Knights is, in addition to a sandbox game, a four-person co-op multiplayer game that features tactical combat and boss battles. The development team is working on introducing split-screen, which players have been requesting for some time, as well as implementing the ability to explore different islands while in the same multiplayer session. We recently reported on Frozenbyte's rogue-like action strategy game Has-Been Heroes in our January 17 edition of the Catch-up coffee, and now we have a confirmed launch date for PlayStation 4, Xbox One, PC, and Switch: March 28. Has-Been Heroes has a story that keeps on growing as the player plays and completes the game.New story layers are added with each playthrough.